Situated on the fringe of Exmouth Town Centre is this spacious 5 bedroom terraced house with a self contained, ground floor, 1 bedroom annexe, parking to the rear, 2 Courtyard gardens and Estuary views from the front. The property is both gas centrally heated and double glazed. The accommodation for the property comprises, on the ground floor, of cloakroom, bay fronted sitting room with a fireplace feature and dining room. On the first floor are the kitchen, breakfast room / utility room, 3 bedrooms, shower room and separate WC. 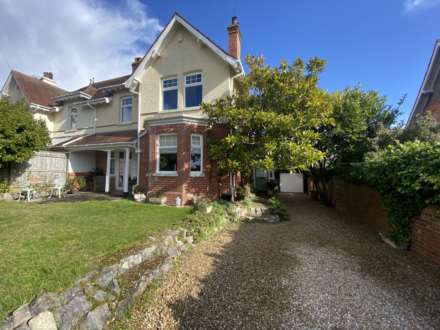 On the second floor are 2 further bedrooms with one gaining far reaching Exe Estuary and Haldon Hill views. The self contained annexe comprises of living room / bedroom, kitchenette and shower room. There are gardens to the front, 2 Courtyards to the rear and a parking spaces. A viewing is advised to fully appreciated the size of accommodation that`s on offer. White suite comprising low level WC and wall mounted wash hand basin. Tiled flooring. Walk - in bay window to front. Focal point of open fireplace having a marble mantle and surround with a tiled back and hearth. Radiator. TV point. Telephone point. Ornate coving. Picture rail. uPVC double glazed French doors leading to Courtyard. Radiator. Window to rear / fire escape with steel external stair case. Space and plumbing for dishwasher and washing machine. Further space for appliances. Telephone point. TV point. Radiator. White suite comprising double shower cubicle with electric shower unit and splash screen door. Vanity wash hand basin. Splash back walls. Radiator. Extractor fan. Access to loft storage space. Obscure glazed window to side. White suite of low level WC. Storage cupboards. Window to rear. Radiator. Airing cupboard housing the gas fired boiler and the hot water tank and slatted shelving. TV point. Picture rail. Window to front with Haldon Hill views. Radiator. Picture rail. Walk - in dormer window to front gaining far reaching Exe Estuary and Haldon Hill views. Pedestal wash hand basin. Radiator. TV point. Walk - in dormer window to rear. Fitted storage cupboards. Pedestal wash hand basin. Radiator. Obscure glazed window to rear. White suite comprising corner shower cubicle with electric shower unit, low level WC and pedestal wash hand basin. Fully tiled walls and floor. Radiator. Extractor fan. Window to side. Radiator. TV point. Steps and a footpath from Exeter Road lead up to the front entrance door. The remainder of the front garden is then laid to lawn with a patio area adjacent to the property. Outside meter boxes. The property has 2 enclosed Courtyard gardens, both being ideal for outdoor dining and entertaining during the fine weather. Wall boundaries. Timber Summer house. Open timber porch adjacent the dining room. Rear pedestrian access via timber garden gate. From our prominent Town Centre office, proceed into Rolle Street towards The Strand Gardens. At the mini roundabout, turn right onto The Parade and carry on to Exeter Road. The property will be found on the right hand side, just past All Saints Church and before Lawn Road.